This page attempts to record what is known about the origin and history of the origami design known as the Love Knot Letterfold. Please contact me if you know any of this information is incorrect or if you have any other information that should be added. Thank you. This sounds very like the Love Knot Letterfold. 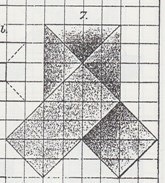 The first illustration of this paperfold appears in Eleonore Heerwart's 'Course in Paperfolding', which was first published in Dutch in 1895 then in English by Charles and Dible in London and Glasgow in 1896. The design also appears in 'Pleasant Work for Busy Fingers' by Maggie Browne,which was published by Cassell and Company in London in 1896.